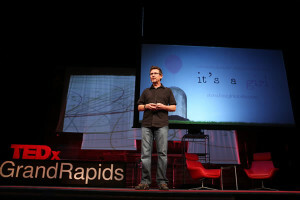 It’s a Girl film director Evan Grae Davis was recently invited to speak at TEDxGrandRapids, engaging an audience of 750 leaders, influencers and innovators from the West-Michigan area on May 9th, 2013. “I had previously been privileged to speak at TEDxGateway in Mumbai, India, where I laid out the foundational issues underlying gendercide. This time, I wanted to address the questions that have repeatedly come up as I speak at screenings and events related to It’s a Girl and the campaign to end gendercide in India and China. It’s A Girl is a very successful documentary where we see how the cultures of China and India have shared many similarities in discrimination against girls. This kind of backwardness and ignorance have threatened the lives of many baby girls. In contrast with India, it was China’s One-Child Policy that exacerbates the persecution of women and offsets the already serious gender imbalance in the country. Experts estimate that the current gender ratio at birth in China is 119:100, and particularly rural areas as high as 125-135:100. In the next 20 years, more than 40 million men will not be able to marry. This problem is not just a social disaster, but is also a grave threat to world peace. In the film, the story of Miss Li does not only reflect the harm to women caused by Chinese tradition that look up to men and down on women, but also discloses rural women’s miserable experience of “illegal birth. In September 2010, WRIC volunteers investigated the reasons behind the sharply decreasing number of girls in rural areas. The most commonly practiced methods of limiting the birth of girls includes killing newborn girls, abandoning baby girls, and prenatal gender selection leading to aborting female fetuses. Since the implementation of the One-Child Policy, families that wanted to have boys without going over the official quota often killed or abandoned baby girls. Villagers explained that a bucket of water would be placed next to the mother giving birth. If the baby were a girl, she would be immediately drowned in water and disposed. Other families abandoned or sold their girls. Buddhist convents in Anqing City, Anhui Province had rescued over a thousand abandoned girls. 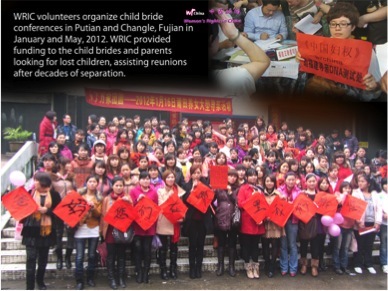 The story of the “Orphans of the Shaos” that was uncovered in 2011 and achieved international media attention happened in The Shaoyang Municipal Children’s Welfare Institute (an orphanage) in HuNan providence, about illegally-born children of peasant families, because of no “fertility permit.” The local government officials sent these illegally born children, mostly girls, to an orphanage, for secured fine, where adoptive families were to be “found” by the orphanage. However, our research has shown that some of these children have been sold to various countries, often at very high prices. Since 2005, the abandonment of baby girls has begun to decrease, but still remains a problem. But boys still vastly outnumber girls. In two villages in Susong County, Anhui, boys accounted for about 65% of births in both 2010 and 2011. An elementary school teacher disclosed to us that there were only 16 girls among 57 students of his in total. Although China’s government has banned gender selection through the use of ultrasound, in reality, private clinics such as mobile vans equipped with ultrasound machinery can determine the gender of the baby in the womb for 100 to 200 Yuan ($30). Government clinics often disregard the ban to help out friends and family or to earn extra income. Some families even buy their own ultrasound machines to make sure of having a boy. To stay within the quota and avoid paying the fines, families choose to abort girls immediately after ultrasound exam. Particularly in rural areas where the persecution of the one-child policy is most severe, female infanticide is still common. China and India are traditional male-dominated societies. Violence and discrimination against female aspects are very similar, but China’s official one-child policy and its 30-year history of implementing it has unreasonably deprived women of their basic rights —- their reproductive freedom. Jing leads Women’s Rights in China. To learn more about their programs to support women and girls in China, go to wrchina.org or http://wrchina2007.blogspot.com. You can also explore additional ways to get involved in the fight against female gendercide through www.causes.com/itsagirl.